The Big Robot Party was thrown by President Richard Nixon as a trick to destroy all robots on Earth (4ACV08). After Professor Farnsworth admitted he caused the problem of Global warming when he created the original modern robot design that produces pollution, Wernstrom called for destruction of all robots. So Nixon invited all of the world's robots to a party on the Galápagos Islands, which was actually a plan by Nixon and Wernstrom to destroy all robots. The only robot who knew the party was a fake was Bender since he was the only robot at the Global warming convention. Despite knowing he was going to die, he decided to go to save turtles from Global warming. Robots travelled from all over the planet to get to the party. At the "party", Nixon told all robots to stay for at least two hours. Every robot was celebrating at the party, except Bender. He whispered to his turtle that Nixon wanted to kill all robots, but a "Microphone robot" heard Bender, which meant all robots could hear it. The panic then was stopped by Bender who tried to explain to the robots they had to die to save Earth and turtles. Nixon and Wernstrom were prepared to kill robots with a laser in Wernstrom's modified mirror. But Professor Farnsworth arrived and told robots they can save Earth from Global warming and themselves from the laser by venting their exhaust directly to the Sun to move Earth further from it, thus cooling it. With the robots' gases they managed to move Earth. Later Nixon rewarded the Professor with the Polluting Medal of Pollution for saving Earth from Global warming and the "Big Robot Party" became a party to celebrate "Robot Party Week" (because Earth is further from the Sun, its orbit is bigger, and the year is a week longer). 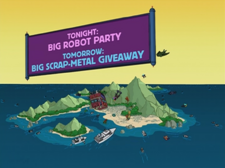 Since all the world's robots went to the party, almost every robot seen before on the show is seen here. This page was last edited on 16 February 2013, at 13:53.